The Art of Editing in the Age of Convergence remains the most comprehensive and widely used text on editing in journalism. This latest edition continues to shift the focus toward online multimedia as more and more people get their news that way. Amid these changes, the authors continue to stress the importance of taking the best techniques learned in print and broadcast editing and applying them to online journalism. The reality is that most people now often first learn of breaking news on Facebook or Twitter, and therefore the challenge for journalists in this new media world is distinguishing the quality and dependability of their work from all the fake news and propaganda memes, now so common online. This book is designed to help serious news providers produce a product that is well-edited and grounded in the best practices of journalism. Brian S. Brooks has served as editor-in-chief of the Columbia Missourian and as European editor of Stars and Stripes, the U.S. military newspaper in Europe and the Middle East. He served as a faculty member and administrator at the Missouri School of Journalism for 38 years, the last 10 of those as associate dean for undergraduate studies. He continues to work part-time at the school. Brooks served as deputy director or director of the Dow Jones News Fund internship program at Missouri for more than 40 years. He is the co-author of four journalism textbooks and is a member of the Missouri Press Association Newspaper Hall of Fame. James L. Pinson has worked for newspapers in Missouri, Colorado and Michigan and holds a doctorate in journalism from the Missouri School of Journalism, where he also taught for six years. He additionally taught 25 years in the journalism program at Eastern Michigan University, where he is now a professor emeritus, and for 13 summers in the Dow Jones News Fund's internship program. In addition to this book, he and Brian S. Brooks are also co-authors of Working With Words: A Handbook for Media Writers and Editors along with Jean Gaddy Wilson (Bedford/St. Martin's). 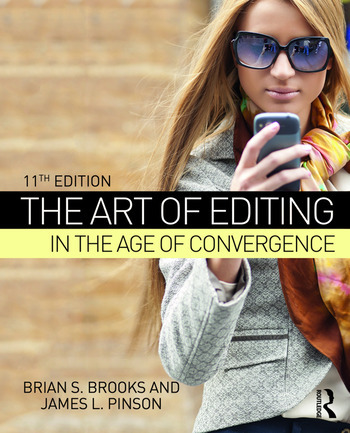 As another brilliant updating of a classic in the field, this latest edition of The Art of Editing in the Age of Convergence teaches the tried and true techniques of editing and how to use them in our changing media environment. A must-read for anyone looking to become an editor.